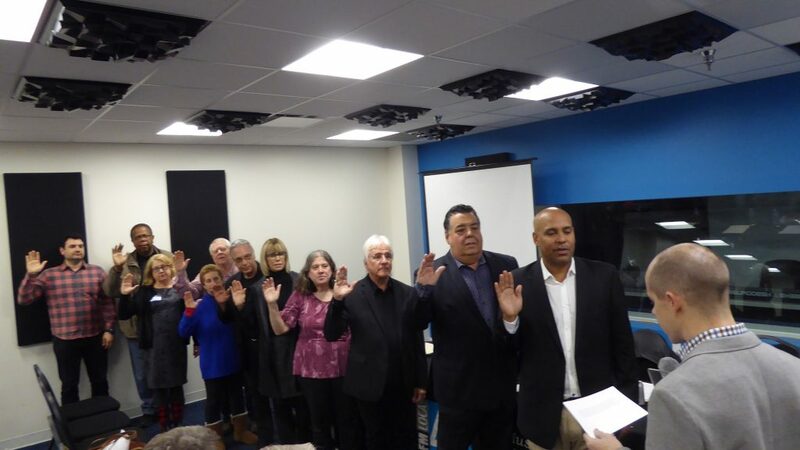 (BURBANK, CA – JANUARY 15, 2019) The newly re-elected members of the AFM Local 47 Executive Board for the 2019-2020 term were officially sworn in today during the Executive Board Meeting. This entry was posted in All News and tagged Local 47 election on January 15, 2019 by admin. Nominating petitions will be available from the Secretary/Treasurer’s office as of Wednesday, Aug. 1, 2018. This entry was posted in All News, Events and tagged Local 47 election on July 26, 2018 by admin. Congratulations to all of these candidates, and thank you for your willingness to serve the membership of our Union! This entry was posted in All News and tagged Local 47 election on September 16, 2016 by admin. 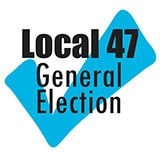 Congratulations to all candidates for office, and thank you to all members who voted, in the 2014 Local 47 General Election. * These are the results of tallying by the California Elections Company of ballots cast by eligible voters of the Local 47 general membership in the Biennial General Election held Dec. 9, 2014. Certification and declaration of the election by the Election Board is pending per Article IX, Section 16 of the Local 47 Bylaws. This entry was posted in Events and tagged Local 47 election on December 11, 2014 by admin. 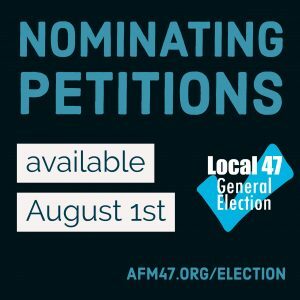 Candidates running in the 2014 Local 47 General Election are reminded that their 100-word campaign statement and photo for inclusion in the November 2014 issue of Overture are due to the Secretary/Treasurer’s office no later than Thursday, Sept. 25. Please refer to Article IX, Section 12 of the Local 47 Bylaws (with amendments through July 2014). The Bylaws are available to read online by logging into your afm47.org member account or by request from the Secretary/Treasurer’s office: 323.993.3159. The Local 47 Election Board reminds nominees to review Article IX, Sections 2, 4 and 6 of the Bylaws, which were revised in 2011. This entry was posted in Events and tagged Local 47 election on September 16, 2014 by admin.